My absolute first attempt at HDR! Perhaps this was not the time...lol! Moving people are not easy, nor plausible, subjects for multiple blend HDR. Very interesting character study, but the tone mapping with black over her skin doesn't improve the shot for me--it distracts. Also, did you consider cropping out the woman on the left; she distracts as well, being faceless. But the others complement the scene. LMAO! Wonderful capture, and title! The photo most certainly fits the title. Not sure it's wowing me much, but I don't think that was the intention here. 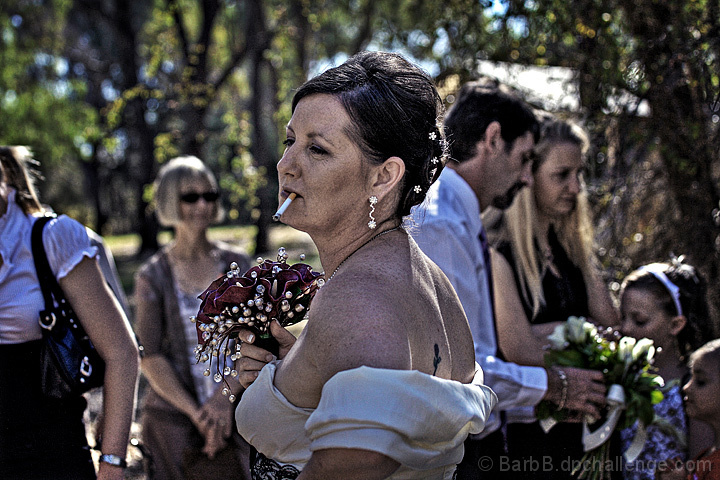 Bit of a busy scene in the background, but a good capture of a moment that is different from the usual wedding photo. I was going to give it a 5, but the more I look at it, the more I appreciate it and I think it deserves a positive side vote. perfect title. she is priceless. love the grunge. her jewelry and cigarette mesmerize. blue cast works. So much can be said in response to that title! Proudly hosted by Sargasso Networks. Current Server Time: 04/22/2019 07:59:00 PM EDT.